"Remote tower operations" is a new concept in air traffic control that's begun to take off worldwide. MITRE is exploring its application to a variety of airport operations in both the United States and in Singapore. When we think about the air traffic controllers who manage flights arriving to or departing from airports, we typically picture them in a tower with windows offering a 360-degree view. But what if the controller could do the same work with real-time camera feeds that replicate or enhance that panoramic view? That idea—known as the "remote tower" concept—has caught on in various parts of the world. It shows particular promise as an efficient and cost-effective way to support operations at small airports without airport traffic control towers. At MITRE, we're researching the remote tower concept for use both at home and abroad, and for large and small airports. 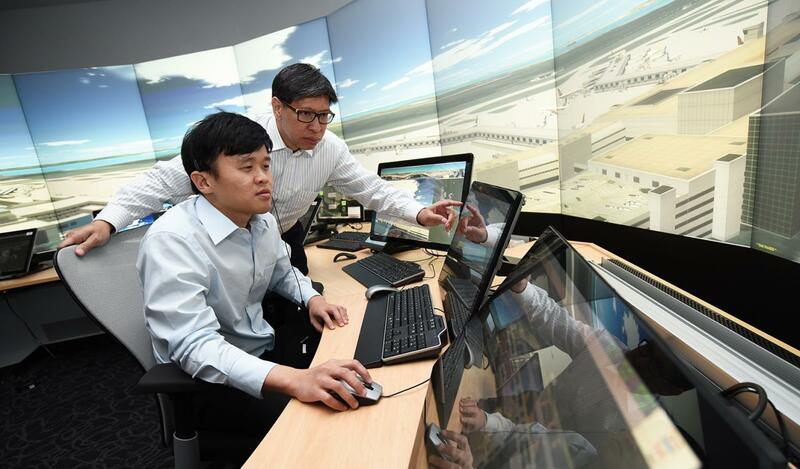 Ground-breaking research we're conducting at our state-of-the-art air traffic management research facility in Singapore—MITRE Asia Pacific Singapore (MAPS)—may result in the first-ever remote tower air traffic control (ATC) operation that can serve all the traffic demand at a high-traffic airport. How Do Remote Tower Operations Work? A remote tower is essentially an air traffic control facility that allows controllers to provide service to an airport without a direct view of that airport. This means that if the remote tower provides the main control for the airport, there may no longer be a need to build and maintain a physical tower. "Instead of a direct view, controllers observe the airport's surface and the surrounding airspace using a combination of camera feeds and surveillance technology available today," explains Tony Colavito, who leads MITRE's work on the remote tower concept and its applications. "The facility might not even be located at the airport. It could be hundreds of miles away." What makes this possible are video cameras mounted on poles erected on the airport surface. Multiple fixed-position cameras project feeds onto an array of connected video screens—mimicking the panoramic, out-the-window view an air traffic controller would have from a physical tower. The system may also include video cameras that can pan, tilt, and zoom. "Just as a controller in a tower might use binoculars to take a closer look at objects or areas of interest, controllers in a remote tower facility can use these cameras to do the same thing," Colavito says. Otherwise, it's business as usual. "Controllers in a remote tower scenario have all the same weather and flight plan information they would have if a physical tower were used. They would have the same surveillance, and they would communicate with pilots in the same way," Colavito explains. "The only thing that changes is the way they obtain their situation awareness of the airport surface and nearby airspace." The concept has been approved for operation at a small airport in Europe and is under evaluation at a handful of other small airports. Industry watchers predict that its use is likely to become more and more common in the coming years. An incentive for the concept's spread is cost savings. Based on cost estimates in the U.S., the construction of a new ATC tower for a small airport costs $5–6 million, on average. MITRE research has determined that remote tower operations at a small airport can be instituted at a much lower cost. MITRE's research on remote towers for the Federal Aviation Administration (FAA) began more than a decade ago. As the concept gained popularity in the United States, we conducted a study exploring the cost-effectiveness of remote tower operations and the development of a long-term strategy for providing remote tower ATC services in the United States. More recently, MITRE has investigated characteristics of airports best suited to remote tower operations and the various levels of service they could provide remotely. "In the United States, airports in Leesburg, Virginia, and Fort Collins, Colorado, are starting to team up with vendors to come up with their plans for remote tower operations," Colavito says. The FAA then has the responsibility of evaluating such proposals and certifying the operations to ensure safe and efficient interaction with other FAA services. "To make that process more efficient, we're helping the FAA develop a standardized approval process they can use to evaluate a remote tower proposal," says Colavito. That work has included developing criteria the FAA can use to evaluate remote tower systems. "We're looking at things like the operations the controllers need to see and how the controllers will use the system." How Will the Remote Tower Concept Work in Singapore? We're also researching the application of the remote tower concept in Singapore, but with a vastly different goal in mind than serving smaller airports. In Singapore, remote tower operations are being considered for Changi Airport, which currently uses two runways to handle as many as 72 flights an hour. MITRE is exploring the remote tower concept as a complement to the actual tower. "As part of this work, we're researching whether it would be possible to use remote tower capabilities to handle all the traffic at Changi Airport," Colavito explains. During the last two-and-a-half years, MITRE has developed a preliminary concept of operations to define how Changi Airport could operate in a remote tower scenario and conducted human-in-the-loop experiments to test the concept. "In 2016, we engaged a production company to set up cameras on the Changi Control Tower at Changi Airport," Colavito says. "We captured footage that simulated what controllers see out the window. We then ran an experiment to see whether controllers could have the same level of situation awareness when they look at the video footage as they do when looking out the tower window. We found that they could." In another human-in-the-loop study, MITRE worked with controllers to evaluate the throughput that could be achieved at Changi Airport using remote tower operations. Overall, controller feedback was positive. MITRE has supported the Civil Aviation Authority of Singapore—the sponsor of the Singapore remote tower work—in bringing industry in to build a remote tower prototype system. "MITRE doesn't compete with organizations that build these types of systems," Colavito notes. "As a not-for-profit working in the public interest, we're an objective party. Our support to CAAS will be to ensure that Singapore achieves its goal of incorporating advanced technologies and maximizing efficiency while maintaining safety."